Little boy wasn’t allowed to play and he was really sad about it. He can’t even reach the table properly that’s why hubby told him he has to wait when he’s older and it’s something he can’t. Kuya was trying his best to shoot his green ball to a pocket. We were a bit cautious since he has asthma and we wouldn’t want the chalk to make him cough especially while on vacation. Ate won second in this game, daddy did good giving tips. Now is the best time to buy swimming gears! Son #1 has a compulsory swimming course for this year. He can swim but not a lot so he to be grouped in the beginner’s group. He’s there with 4 others. I explained to one of the grandmoms who I often talk to when picking him up that even though we often go to swim, the kids always have their swim floaters on. She was a bit surprised when I said that I myself can’t swim well. She said; “the Philippines is surrounded by water, how come you never learned how to swim?” I myself had to wonder. Eliminating the fact that I get sunburned easily, I said “maybe because we’ve always had those beaches that I took it for granted…knowing that the sea is just there and I could swim whenever I want to.” Makes sense…now that we live in a city far from the sea, I not only miss the sight of blue, I also miss the foods of the sea – all freshly produced. Anyway, we hurriedly looked for swimming trunks and other gears for the first day. There were also a lot of moms looking for swimming gear so we had to hop to three shops, on the third shop C&A, we were able to buy items on sale, 70% off. His swimming trunks, swimming shorts costs 7€ and 14€ respectively, but I only paid 6€”! A really big discount. I also bought him this big blue towel enough to cover him, he’s had bronchitis then and now so I wanted to make sure that he doesn’t get so cold when he gets out of the water. So if you’re planning to buy swimming gears, now is the best time to do so…autumn sale for summer stuff! 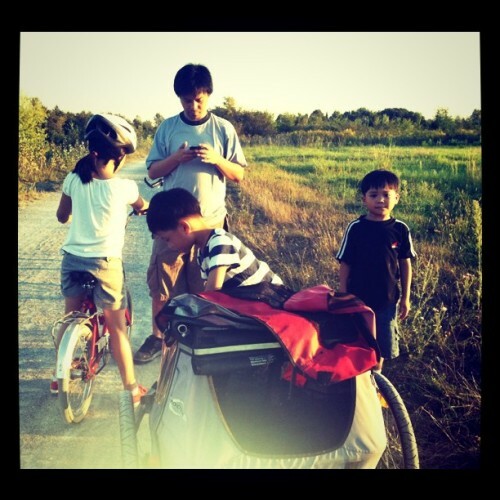 Some weeks ago hubby bought a bicycle trailer so that the boys can come with us when we go cycling. Though C can already ride a bike, he can’t go for long rides. D can’t even ride one with those support wheels. I think we need to spend more time with him on this one. teehee! So we’ve been cycling every Saturday. We would sometime go on a bike tour with friends. The boys had a lot of fun…we would stop by at some point to take photos of the sunset and the surrounding area. We even stopped by a playground last Saturday. However, after all the fun it is inevitable to not encounter a bit of accident, sometimes big and we as parents are the very first to panic. We see to it that all bikes are in good condition, brakes and all but we can’t control how things would go…unfortunately. Little girl fell off her bike when we were going under the bridge on a rough road. She got bruises on her tummy, left arm and knee while the right arm was totally hurting. That was around 7:40 PM. We rushed to the hospital and arrived around 8:30PM. It’s overwhelming how many patients could be at the emergency room! The patients come as young as a year-old upto 80-years and above. I told a nurse my observation and he confirmed that it’s true. Either the really young ones or really old are mostly brought to their department. After a check-up, an x-ray, an anesthesia, a cast and another x-ray we were good to go. It took us past 12 midnight to be home.